British Museum Scientist Joanne Dyer talks about the new scientific techniques that are casting ancient objects in a new light. Take a walk to the end of Room 73 at the British Museum and you will meet some of my favourite ladies. 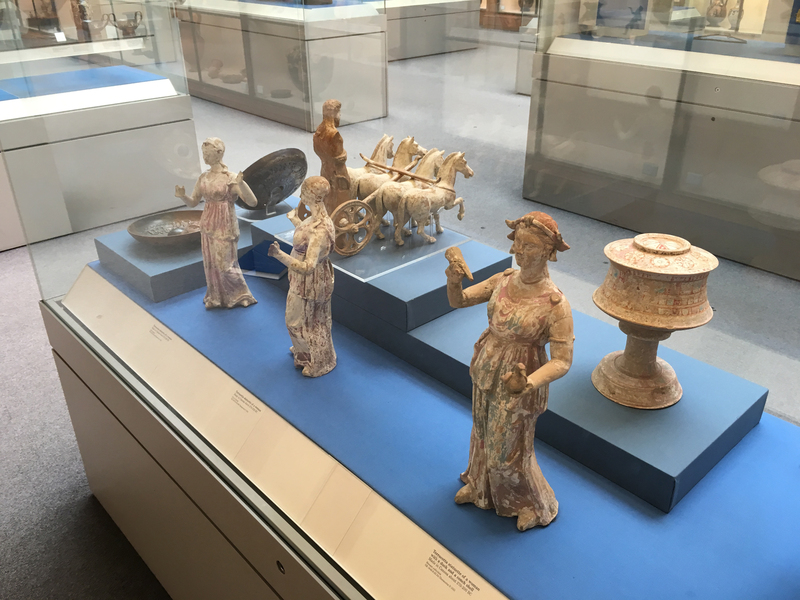 Made of terracotta and dressed in vivid shades of pink and blue, these Hellenistic figurines were once made all across the Mediterranean as offerings to be placed in tombs. A selection of terracotta figurines on display in Room 73. Statuette of a woman with duck and conch shell from Canosa di Puglia in Italy, 270–200 BC. From left: in visible light (VIS), and showing the visible-induced visible luminescence (VIVL) and visible-induced infrared luminescence (VIL). This is because these pink and blue pigments are luminescent, which means that they are able to absorb light of a particular colour and then re-emit it at longer wavelengths. 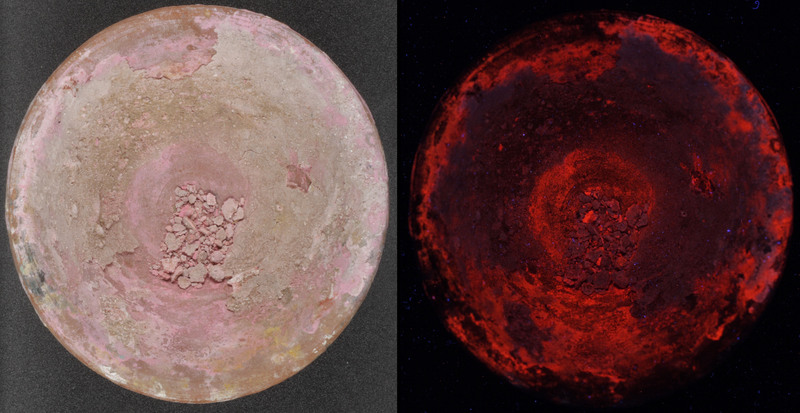 For pink organic lake pigments, particularly those made from the root of the madder plant, such as those in the ancient paint pot below, ultraviolet or visible light is absorbed and pink/orange light is produced. Pottery paint saucer containing madder lake pigment, found at Hawara, Egypt, 1st century AD. From left: in visible light (VIS), and showing the UV-induced visible luminescence (UVL). For Egyptian blue (a bright blue inorganic pigment), red light is mostly absorbed and infrared light is produced. Infrared light has no colour, but using a specially modified camera we can record the light emitted as photographic images, which appears bright white. As these properties are specific to these two pigments, we can use this to identify them on objects, even when very small particles remain. Usually these images are taken using two different experimental set-ups, but now thanks to new research carried out in the Museum’s Department of Scientific Research, together with colleagues in Greece, we can use the same set-up to record both of these images. The new technique uses different colours of visible light, blue and red from LEDs in turn, to make the pigments luminesce. It is much safer for both objects and users. 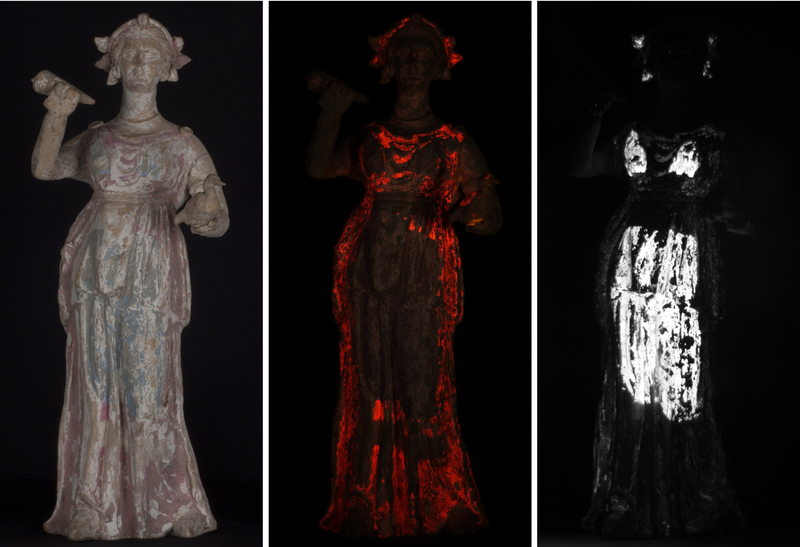 From left: detail of the figurine in visible light (VIS), and showing the visible-induced visible luminescence (VIVL) and visible-induced infrared luminescence (VIL). The images can also show us where each pigment is present much more precisely than our eyes can make out. So by looking closely at both images we can see that although areas of the lady’s dress appear pink (and luminesce pink/orange), the same area also shows some blue particles that are faintly luminescing white. By allowing us to see that a mixture of blue and pink pigments were used to make the purple colour of the lady’s dress, the new set-up also allows us to begin to understand more about the ancient painting techniques used to create these beautiful objects. You can read the full paper on the new research here.